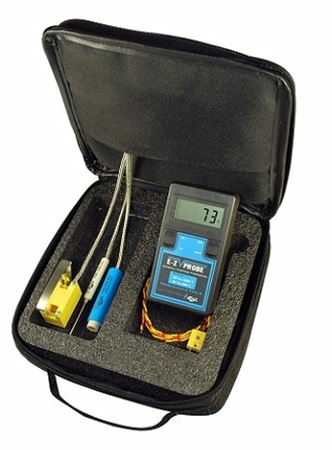 E-Z Probe Pyrometer - accurate and durable compact pyrometer. Straight Surface Sensor - designed to measure all flat, smooth surfaces with accurate and fast response. Roller Contact Sensor - provides speed and accuracy when measuring cylindrical surfaces. Standard Needle Sensor - for general use in liquids and subsurfaces. Welded Wire Sensor - ideal for heated enclosures, ovens, vents, ducts, HVAC or wherever simple temperature measurements are practical. Protective Carrying Case - Durable Cordura material with molded foam insert for safe transport and storage. Dimensions 4.8" x 2.7" x 1.0"